What is Cosmetic Sedation Dentistry? Basically it is a cosmetic dental procedure done under full IV dental sedation. The benefits of sedation during cosmetic procedures such as porcelain veneers and cosmetic dental implants are obvious. Who would want to sit through getting all your upper teeth worked on for porcelain veneers or crowns. Often fear of the dentist, dental anxiety, gagging or difficulty getting numb can scare people away from any dental work including cosmetic dentistry. 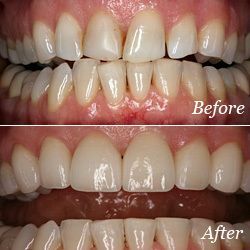 no one dental procedure can transform an old, worn-down smile faster than cosmetic porcelain veneers done by a skilled and talented cosmetic dentist. A good cosmetic dentist is hard to find. Routine dentistry is a completely different skill than cosmetic dentistry. Cosmetic dentistry is both a difficult, inexact and subjective art and a complex bio mechanical medical science. The subjectivity is because not every person wants the same smile. Communication and setting expectation about what the smile will look like is very important. 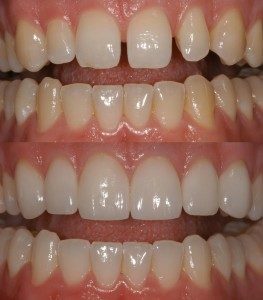 Porcelain and zirconia crowns are sometimes necessary when the entire outer part of the teeth are worn down and the smile needs to totally be built up. In fact, most smile re-designs need crowns than veeners. Very rarely do teeth only wear on the edges of front teeth. 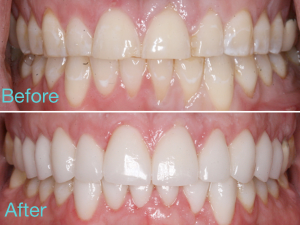 Repair of the edges of teeth and spaces between is what veneers are good at doing. Usually teeth are worn down by a functional TMJ-TMD problem. The entire outer surface of the teeth wears down like the tread of a tire. Porcelain crowns rebuild the entire outer layer of the teeth. If the cosmetic dentist does the case properly, the new teeth will not only look gorgeous, but also function properly, so the teeth do not wear down again.